Narcan nasal spray is a pre-filled, single dose, intranasal spray that contains naloxone hydrochloride as an active ingredient. It is an opioid antagonist used for the treatment of opioid overdose in the case of emergency. It is also given in a case of suspected opioid overdose manifested by respiratory depression. Narcan nasal spray is the one and only FDA approved emergency treatment of opioid overdose in nasal spray form. It is intended for immediate administration where the opioid overdose is suspected. Narcan nasal spray can be given to the patient who consumed a heavy amount of opioid or to the patient with signs of breathing problems, excessive sleepiness or if he/she is not being able to respond. Narcan nasal spray should be used as an emergency treatment but it should not be replaced by the emergency medical care. After administration of the first dose of Narcan nasal spray, emergency medical care should be given immediately because even after the first dose of Narcan nasal spray, the patient may relapse into difficulty in breathing or deep sleep. Is Narcan nasal spray narcotic? 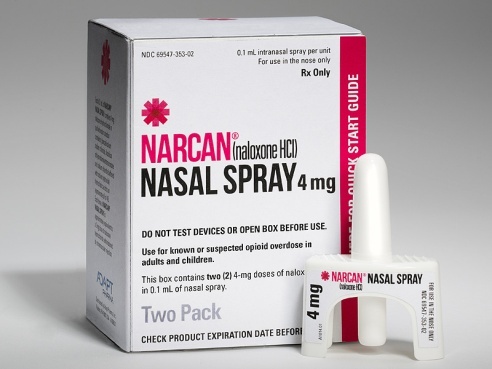 Narcan nasal spray is not a narcotic but used for the treatment of narcotic (opioid) overdose. Narcan nasal spray contains Naloxone, which is an antagonist of narcotic (opioid) that reverses the effect of narcotic. How Narcan nasal spray works? Narcan nasal spray acts by antagonizing the effects of opioid by replacing the opioids from the opioid receptors in the brain. Narcan nasal spray (naloxone) competes for same receptor sites of opioid in the brain and reverses the effects such as respiratory depression, sedation, and hypotension caused by opioid overdose. A single dose of Narcan makes the breathing easier and helps patient to keep awake, however, relapse can occur after few minutes. Narcan is beneficial even if the opioids are taken with alcohol. Why Narcan nasal spray is prescribed? Narcan nasal spray is prescribed for the emergency treatment of known or suspected opioid overdose as seen by respiratory depression ( a problem in breathing or loss of breathing) or central nervous system depression (excessive sleep). Narcan is designed for emergency and immediate medical care where opioids are suspected, however, it is not a substitute for emergency medical care. 1spray of Narcan nasal spray delivers 4 mg of naloxone HCL. Narcan nasal spray should be sprayed into one nostril as one spray in adult and pediatric patients. After one dose of Narcan nasal spray, the dose should be repeated and one should seek emergency medical attention as soon as possible. The exact dose of Narcan can be decided by knowing the amount, type and route of administration of opioid being administered. The spray should be administered in alternate nostril with each dose. Effect on excessive or unusual sleepiness that may be caused by central nervous system depression. The patient may have consumed opioid in overdose if you cannot awaken the person by rubbing firmly on his chest or by calling the person in loud voice. Action on shallow breathing or in the case of no breathing, if an opioid overdose is suspected. Works on contracted pupils also called “pinpoint pupils”, which can be identified as a very small black circle in the center of the colored part of the eye. It can be seen in the person with opioid overdose and in the person who is difficult to awaken. The effect of Narcan is not long lasting and its effect will not last as long as effects of opioids. In the treatment of a person with an opioid emergency, one should seek medical emergency even after administration of Narcan nasal spray. In addition, it is also necessary to include artificial respiration and mechanical ventilation in the treatment of opioid overdose. Can Narcan nasal spray proper be used in pregnancy? Pregnant women can use Narcan nasal spray only with caution. It should be used when clearly needed and benefit outweighs the risk. However, no embryotoxic or teratogenic effects observed. This drug can cause withdrawal symptoms in the mother as well as fetus. The mother and the fetus should be monitored in case of signs of distress. The blood pressure should be monitored at the time of labor as it can cause severe hypertension. Can Narcan nasal spray be used during breastfeeding? A Nursing mother should take caution while feeding infant as it is excreted in human milk. The effects of this medication in the nursing infant are not known because it is not orally bioavailable. It also does not have any effect on prolactin or oxytocin hormone levels. What are some side effects of Narcan nasal spray? Narcan nasal spray is contraindicated in the person who has hypersensitivity to naloxone hydrochloride. It is also contraindicated in the person who is allergic to ingredients of Narcan nasal spray. Can Narcan nasal spray cause dependence? No, Naloxone does not cause any dependence, because it has no potential for abuse. It works only on opioids overdose and does not work in absence of opioids. Can other drugs interact with Narcan nasal spray?